"I Would Never Live in Tornado Alley" Really? That's how you choose? This spring has been a hard one for those of us who live in the middle of the country. We have had flooding rains that don’t seem to stop, late freezes and the tornado season, while it started late has been especially harsh. With the tornado that ripped through Moore, Oklahoma recently it seemed more people outside of “tornado alley” have started paying attention. But Friday…. the Friday where big storms hit both Oklahoma and Missouri, I think that was the one that really took things to a new level. Friday night, May 31 I was on social media, trying to find out where dear friends were and hoping the ones I couldn’t find were tucked away safely in a basement or bunker like lots of former Oklahomans. My friends Shawna & Aladdin had a car accident on Thursday, so they particularly came to mind as I watched the news report about multiple tornadoes in and around Oklahoma City. I had finally found them — they had shelter and were telling me about the accident and how closely they were watching the news when the sirens went off here and I decided I better get into the basement. It is something I have done half a dozen times or so since moving to St. Louis a little less than two years ago. We do this in the spring in varying amounts and we pay attention to sirens, weather radios, etc. It is no fun sitting in the basement wondering if punishing weather will soon hit your house (and I have done it with my iPad in tow for years). And it concerns you deeply that while listening to the local TV weather person you can hear that a tornado has been spotted a zip code or two away…. in an area where you have friends living or where you frequent local restaurants. You feel a since of loss as soon as you hear a tornado is on the ground even if you don’t know where it is and who is impacted. And that is a feeling far too many of us in the middle of the US know all too well. So why & how do millions of people live in tornado alley? Although we ask ourselves why we choose to live in places where such devastating weather is predicted on something of a regular basis, it always strikes me as strange to see & hear so many people say they could never live in this part of the world. It is a quick response driven by fear of weather and is pretty close to the same thing I heard when I told family members I would be leaving the south and moving to New York….. I would never live somewhere that cold, that crowded, that…..
People live in a variety of places for a variety of reasons. For most Americans, there was a time when our family immigrated to the US. Those family members tended to settle in various places. If those places offered the chance to make a living people tended to stay, if not, people moved further inland. In the early days of the country, lots of people stayed in places like New York and Boston but a lot felt the need to move further inland to find areas they could farm, or get some additional space to move about or whatever. More recently people choose where to live a lot differently, but the reality is many of us have deep roots in the middle of the country. We know that tornadoes are something to fear or at least respect which is why I took cover in my basement and why my parents used to load us kids up in the bathtub when funnels got near the house. People who live in hurricane areas tape windows and leave town. People who live along faults are generally prepared for earthquakes and know to get in the doorway or get outside. People who live in blizzard-prone areas know to stay in their car rather than walk for help. All of those places are perfectly reasonable places to live for people from there. For people not familiar with it, it can be scary as hell! I know, I faced my fears in December and went to Bismarck, North Dakota…. and yes, I flew through a blizzard to get there. I relied on friends to help me figure out what I should be doing. It certainly has been a tragic time for people in OK and the midwest. We all pray for those affected by these terrible weather related events. Thank you Deanie. A friend’s brother lost his home…. it is more than tough. He certainly has appreciated how many people want to lend a hand. That’s one of the things about our fly over states…. folks sure are compassionate about others! I think people live where they grow up, where there family lives, and where their culture is. Those are the things that are important to most people. The other factors like weather and cost of living are things that you put up with to have the things that are important to you. I moved to St. Louis to work with Monsanto and to be closer to my family in Arkansas and my wife’s family in Mississippi. I’ll put up with the St. Louis weather extremes, including tornadoes, flooding and droughts, to have the things that matter most to me and my family. A lot of families stay in certain areas but I have to admit, my family isn’t a good example of that. Both my parents had siblings that moved long distances away and in my generation all of my brothers & sisters have lived at least a days drive (or more) from home at various points. Now I have a sister in Memphis, but the others are in NC, OH & me in MO. None of us picked areas simply based on weather patterns though. People think Chicago weather is crazy. Especially people from New York. When someone from New York scoffs at the Chicago weather, I usually change the subject to my yard. Because I have one and I love it so much I am happy put up with the weather. Everywhere has something. But just one place can be home. Seriously… you and I are so on the same page here. I lived in New York four years and they have these things called nor’easters that scared me to death! Its like a hurricane dumping snow on you! I mean everyone hears about lake effect snow, etc but somehow I had never heard about nor’easters! And one of them was so bad they had to send divers in on the FDR to pull people from cars. That’s some scary stuff I tell you but it still isn’t the reason I left. I left NY because I wanted to be able to have disposable income and that looked like it would take FOREVER for me living there. There are LOTS of things about NY I totally love and still miss despite having left the area a lifetime ago. I love a chance to visit. Hey. I found this post randomly looking about info on what goes on inside a tornado…randomly. 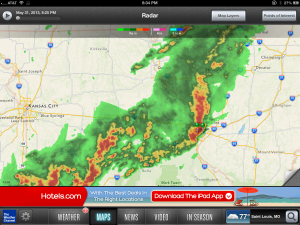 I’ve lived in BA/Tulsa area for a few yrs while in school and the weather here was very intimidating at first. I’m a CA girl who only ever had to deal with tiny earthquakes and small bouts with rain, but nothing extreme. I agree that you adjust to your atmosphere and learn to prepare accordingly no matter where you live. If you love it you learn. Weather shouldn’t really be a determining factor. Despite the weather I love OK, and if asked to pick 1 place to raise my family it’d be here, not CA. California has much tamer weather, but there is an atmosphere and community here you couldn’t get anywhere else. My family freaks out during weather threats and asked why I picked here numerous times and my mom said she liked the area during her visits, but couldn’t deal with the weather, especially during winter. I pick quality! This is my home. So glad you stumbled into the blog Ashley! I love Oklahoma as well. There is a quiet pride & an interest in each other that isn’t common in some of the cities I have lived in. I live in New England. This is an expensive place to live for a very good reason. Culture, great educational opportunities, higher paying jobs, and few natural disasters. Yea, we have Nor’easters, but there is always advanced warning, DAYS of advanced warning. If you don’t live by the ocean, you are fine. I will never have to worry about weather destroying my home. Amy, I think you make some great points about New England but I can’t help but wonder if you underappreciate the rest of the country at the same time. And maybe history has something to do with it as well, I think a lot of the things that distinguish New England from the fly over states can be attributed to history & the kinds of people who landed & stayed in the northeast versus those who kept migrating elsewhere. Maybe those factors impact the expensive place to live. I think it is great that in New England you don’t have to worry about your home getting destroyed. I know hurricane patterns are changing so that’s not true for everyone in the northeast.